Essingen, a village (population of 1,500 in 1950; 6,445 in 2006) three miles northeast of Landau in the Palatinate, Germany (coordinates: 49.234722, 8.171944 [49° 14′ 5″ N, 8° 10′ 19″ E], in the late 18th century the center of an Amish Mennonite congregation, descendants of refugees from Switzerland, who lived in the neighborhood of Landau. Elder Hans Nafziger was a leading personality. Two Amish Mennonite conferences were held in Essingen, attended by ministers of the congregations at Montbeliard, Alsace, Breisgau, Lorraine, Palatinate, Nassau-Weilburg, and Waldeck. At the first of these conferences, held on 1 May 1759, 13 congregations were represented; at the second, 22 November 1779, there were 19. An Ordnungsbrief was drawn up at each meeting, both of which have been preserved. In 1809 Essingen contributed 10 doubloons to the traveling expenses of the Mennonite delegates sent to interview Napoleon on behalf of exemption from military service. Nothing more is heard of the Essingen congregation. Toward the end of the 19th century and early in the 20th there was a small congregation at St. Johann near Albersweiler (somewhat to the south of Landau). Its last elder, Jakob Hege of Mörlheim (east of Landau), died in 1911. After his death Matthias Pohl, the minister of the Sembach congregation, held services in Landau; later the ministers of the Deutschhof-Geisberg congregation performed this service. But this group was not Amish, but Mennonite, and had nothing to do with the Essingen Amish congregation. The few Amish families which continued to live in the Essingen neighborhood after the dissolution of the Amish congregation maintained connection with the Amish congregation across the Alsatian border near Wissembourg, called Lembach or Froensburg, later Fleckensteinerhof. After the meetings at the latter place ceased in 1929, the remaining Amish families in the neighborhood affiliated with the Deutschhof-Geisberg congregation, which held occasional meetings in Landau. The Essingen congregation was called the “Pfälzer Obere Gemeinde” in the signatures to the 1759 Ordnungsbrief, when the following ministers signed: Jörg Holi, Christen Nafziger, Christen Imhof, Jakob Holli, Hans Nafziger. In the 1779 Ordnungsbrief the signature of the congregation appears as “Essingen,” with the following ministers signing: Hans Nafziger, Christen Nafziger, Christen Erismann, Jakob Ullmann. In the Lutheran church book for Essingen for the years 1730-61 deaths in the following Mennonite families are reported: Hans and Michel von Huben, Ulrich, Johannes, and Peter Nafziger, and Valentin Gingerich. From the evidence in the Karlsruhe Landesarchiv, the following families belonged to the Essingen congregation ca. 1780: Christian Bürky and Johannes and Christian Ehresmann (all three living on the Mechtersheimerhof), the Ullmann and Gingerich families on the Pfalzhof (Breitwieserhof), Christian Nafziger of Geilweilerhof, and certain unnamed families in Mühlhofen (Pfalz-Zweibrücken) and in Essingen (estate of Baron von Dalberg). Somewhat later the Schönbeck and Wagler families appear here. Bender, H. S. “An Amish Church Discipline of 1779,” Mennonite Quarterly Review XI (1937): 163-68. Correll, Ernst. “The Value of Family History for Mennonite History: With Illustrations from Nafziger Family Material.” Mennonite Quarterly Review II (1928): 66-79, 151-54, 198-204. Mennonite Quarterly Review I (1928): 71, 198 ft.; III (1930): 140 ff. Müller, Ernst. Geschichte der Bernischen Täufer. Frauenfeld: Huber, 1895. Reprinted Nieuwkoop : B. de Graaf, 1972. Schowalter, P. “Die Essinger Konferenzen 1759 und 1779. Ein Beitrag zur Geschichte der amischen Mennoniten.” Mennonitische Geschichtsblätter III (1938): 49-55. Sommer, Pierre and Paul Schowalter. 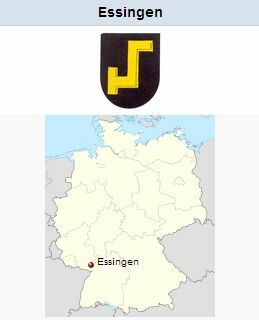 "Essingen (Rheinland-Pfalz, Germany)." Global Anabaptist Mennonite Encyclopedia Online. 1956. Web. 22 Apr 2019. http://gameo.org/index.php?title=Essingen_(Rheinland-Pfalz,_Germany)&oldid=143549. Sommer, Pierre and Paul Schowalter. (1956). Essingen (Rheinland-Pfalz, Germany). Global Anabaptist Mennonite Encyclopedia Online. Retrieved 22 April 2019, from http://gameo.org/index.php?title=Essingen_(Rheinland-Pfalz,_Germany)&oldid=143549. Adapted by permission of Herald Press, Harrisonburg, Virginia, from Mennonite Encyclopedia, Vol. 2, p. 250. All rights reserved.